Hi everyone. 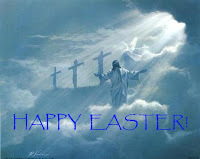 I just wanted to wish everyone a most Happy and Blessed Easter, before time got away from me. Today was our cooking day. Good Friday in our family is actually devoted to cooking all of Easter brunch. Then tomorrow at noon I have to have a basket packed to take to church and have the food for the brunch blessed. This concept was totally foreign to me until I married my husband. I never even knew a tradition like this existed, but I have come to embrace it and enjoy it. The tradition of cooking the meal and getting the basket blessed was passed on to me in 2001 when my husband's mom passed away. I don't know why, but it always important me to do this the best I can--I guess for my husband's family. It's actually pretty comical if you think about it; a true Italian trying to do her best to hit all the traditions of her Polish/Slovak husband's family. Well, I have had no complaints--yet. So today we cooked the ham, kielbasa, got the Paska, lamb butter, dyed the eggs, and cut all the cheese. It's all together in the refrigerator so tomorrow we'll get up, pack the basket and take it to church. I really thought it was interesting that my father-in-law said that when he was a kid, the families would fill the tables with all the food, and the priest would come to the houses to bless the food. It's something he really misses. On Sunday after church everyone will come over, we'll have our big brunch--which I won't have to cook, and then enjoy a big Easter Egg hunt with the children. It's an enjoyable time. Anyway, I just wanted to stop by quickly and tell everyone that I hope they have a most Blessed Easter with all their family and friends. Sounds just lovely. What an interesting tradition. Happy Easter and God Bless you and your family! It's always interesting to mix Italians and Polish. Have a very Happy/Blessed Easter! Glad you had a Blessed Easter.